If you're going to see Built to Spill in concert, be sure and check to see who the opening band is. If the opening band is Caustic Resin, you may want to show up to the concert a little late. Who are Caustic Resin? And why should they be avoided? Caustic Resin are another band from Boise, Idaho. Frontman Brett Netson actually plays with Built to Spill from time to time, and his work there compliments the rest of the band fine. But his own band, Caustic Resin, is one of the shittiest and most boring bands I've ever been forced to sit through. 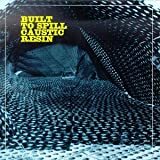 The unfortunate thing for Built to Spill fans is that Caustic Resin often opens for them on tour due to the friendship between the two bands. This friendship also resulted in a split EP, appropriately titled Built to Spill Caustic Resin to be released in 1995. The first two tracks are superb Built to Spill classics that fit right in along with 1994's There's Nothing Wrong with Love. The last two tracks, however, are bland and annoying, much like a Caustic Resin live show. For Built to Spill fans, this EP is worth getting for the first two tracks. The last two tracks, however, probably won't get listened to much.